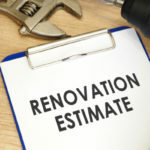 Kitchen Cabinets and Granite Countertops, Pompano Beach FL > Blog > Blog > Which Kitchen Countertop is Best for You? 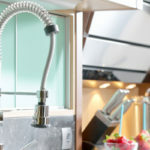 Kitchen countertops today have to meet a myriad of requirements for savvy homebuyers and homeowners. Everyone wants a hardworking countertop that delivers durability and longevity, along with beauty and style, and still remains within budgetary requirements. Here is a list of today’s trending kitchen countertops including their positive and negative attributes. Granite remains a top choice for kitchen countertops for its natural beauty and the fact that is can complement virtually any kitchen style. 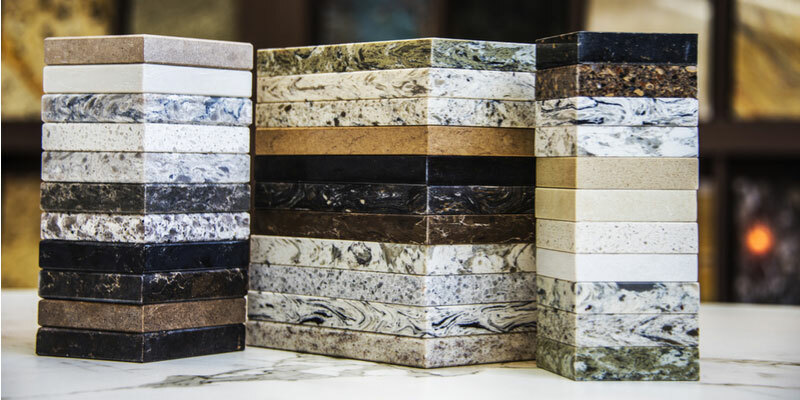 Granite countertops offer a wide range of colors, patterns, and thicknesses, come in multiple grades, and feature a price range of $25 to $100 or more per square foot. Granite offers a number of positive attributes. It is resistant to heat, chips, and cracks. With the addition of annual sealer, granite is also stain resistant. On the down side, granite is not impervious to accidents. For example, if you hit it accidentally with a heavy item, you can chip the edges and if you fail to seal it annually, oil will seep into the stone and discolor it. Granite, because it is natural stone can make seams visible. Quartz is among the top choices in countertops today, a combination of nature’s brilliance and man’s ingenuity. Quartz countertops are a combination of resin mixed with crushed quartz which results in countertops that mimic granite patterns and colors. 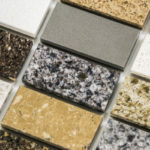 Tougher and more durable than natural stone countertops, quartz countertops range in prices from $40 to $100 per square foot. On the positive side, quartz is resistant to cuts, chips, cracks, stains, and bacteria. As a bonus, quartz doesn’t require sealing. Quartz has a sleek and contemporary look and feel that may or may not match your kitchen style. 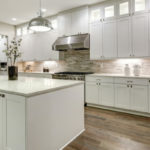 On the negative side of things, quartz is pricier than other options, and isn’t as heat resistance as the less expensive crushed glass or granite choices. In lighter colors, seams are often visible, and darker colors discolor in direct sunlight over time. Rising quickly in popularity, crushed/recycled glass countertops are beautiful and durable. On top of that, these countertops are eco-friendly, created from recycled glass bottles, windshields, and traffic lights. It comes in two styles: set in acrylic or set in cement. Crushed glass countertops offer a price range of $60 to $120 per square foot. Crushed glass countertops offer a number of positive attributes – they won’t scratch, chip, burn, or stain. They don’t need sealing, nor do they fade. As far as negative attributes, heavy items placed on the countertop’s corner can cause cracking. Acidic foods, if not wiped clean quickly, can eat away the acrylic. The price can also be a negative for some, as less costly options are available. Solid Surface Countertops are generally created from polyester resins, acrylic, and marble dust. They come in a number of colors and patterns and range in price from $35 to $100 per square foot. The positives of solid surface countertops include the fact that they don’t require special cleaners or sealing. Surface scratches can be sanded away. These countertops can be molded to integrate a bowl sink or a seamless backsplash. On the negative end, solid surface countertops cost almost as much as granite and quartz but can lack the style. Solid surface countertops easily burn and scratch. And for those who prefer a natural or eco-friendly option, solid surface counter tops don’t fit the bill; it requires energy intensive manufacture from non-renewable resources and is not easily recycled.